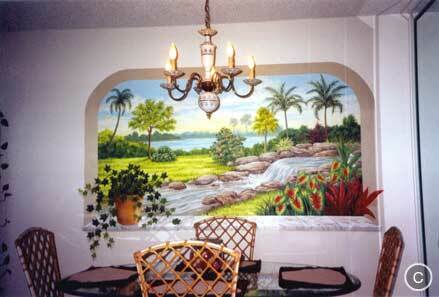 Have a professional artist paint quality murals in your home. of spaciousness. 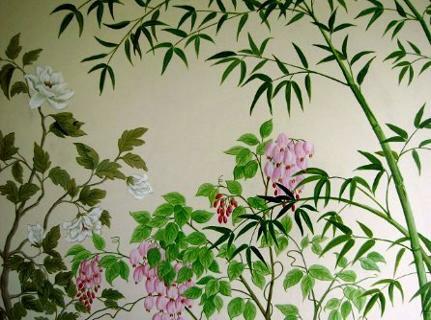 The term "trompe l'oeil" is a French term, meaning "To fool the eye". 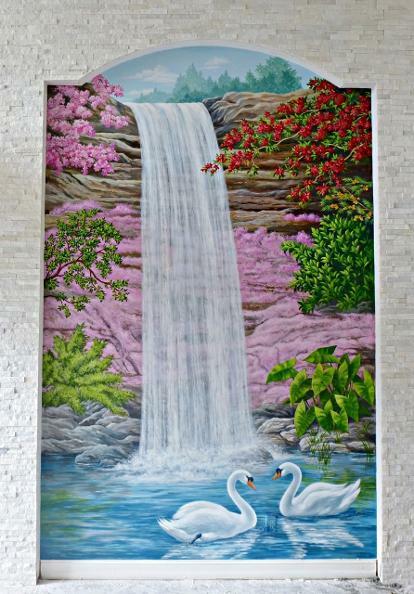 meet your needs, resulting in a truly fine-quality piece of artwork. Client satisfaction is my goal. 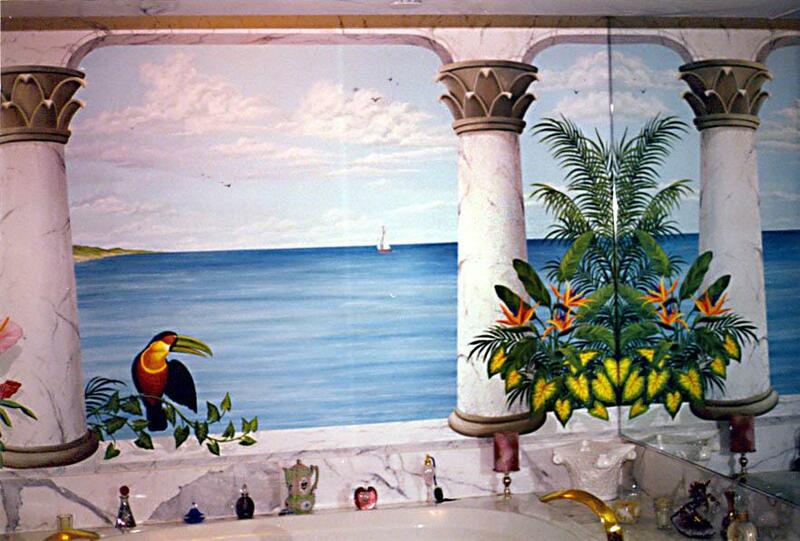 ABOVE: On the wall above a jacuzzi bathtub these columns and scene of the ocean were painted to give an open view. 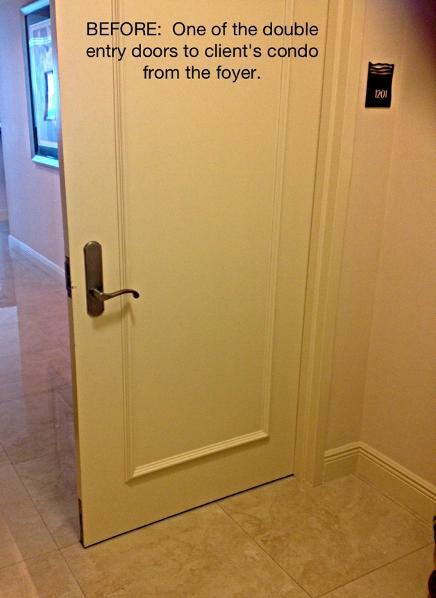 Notice the wall mirror to the right which expands the view. 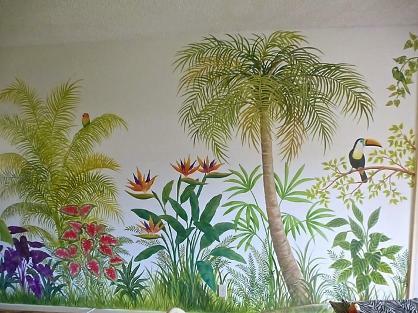 Below: A botanical theme of tropical plants and birds, spans a wall of a living room. Above: A work in progress. 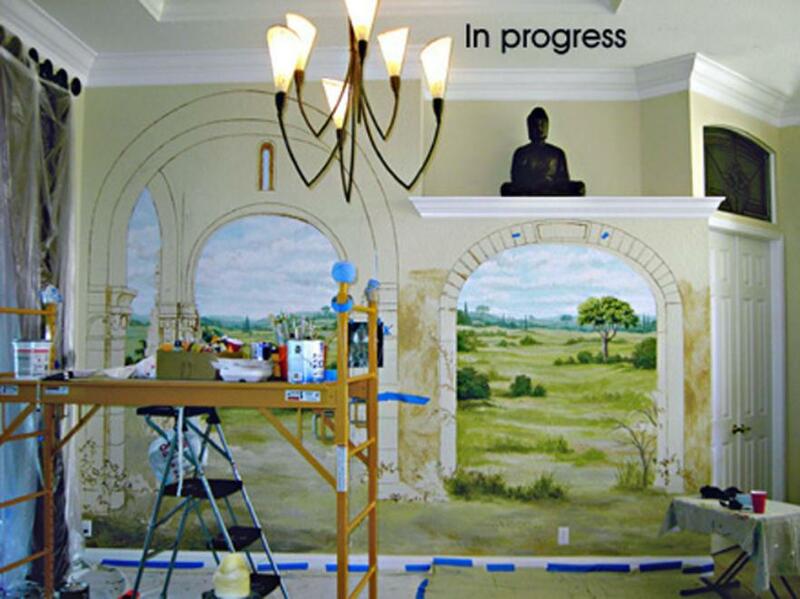 The very early stages of this trompe l'oeil mural show the archways just sketched in with the landscape partially painted. 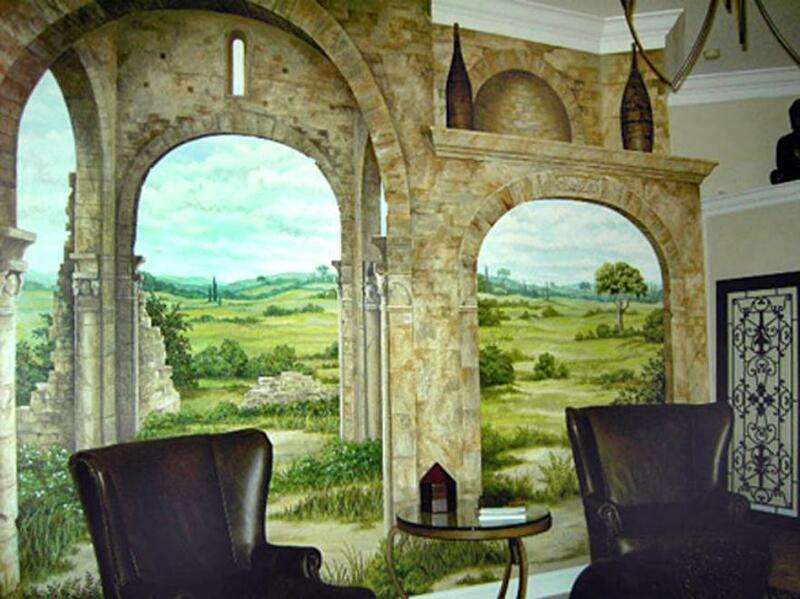 Below: The completed mural - a beautiful Tuscan Landscape as seen through the archways of an old ruin. 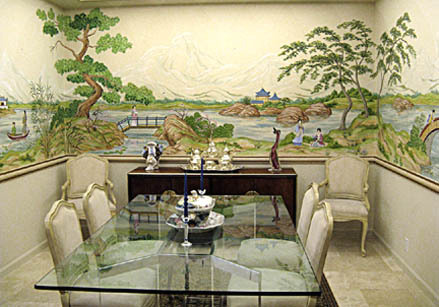 This mural was painted in the living room of the client's home. Below: An elegant place to dine, surrounded by a beautiful Japanese Landscape with strolling Geisha girls. 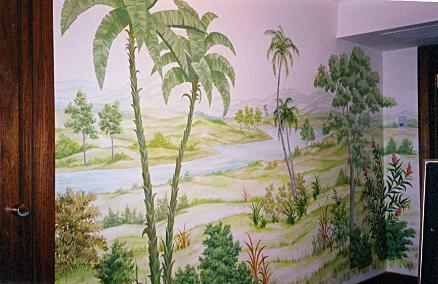 Above: A typical Florida Everglades type of scene, perfect for a bathroom wall. Below: Tuscan Landscape. 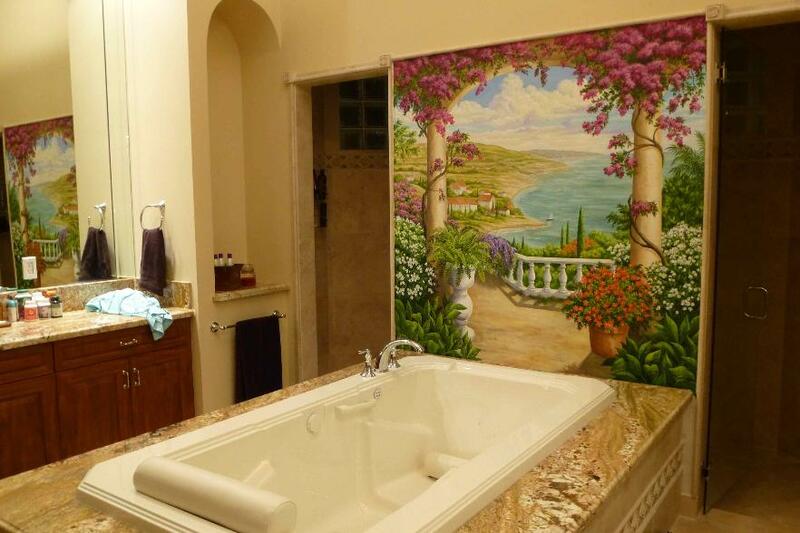 This mural was first painted on canvas, since it would be difficult to paint it directly on the wall over the tub. 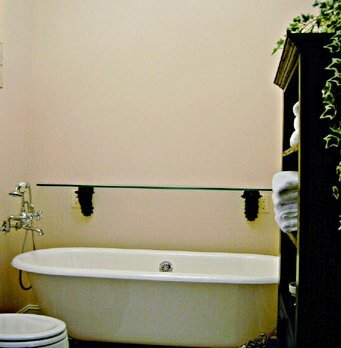 Installed within a frame above the Roman tub in the client's home. 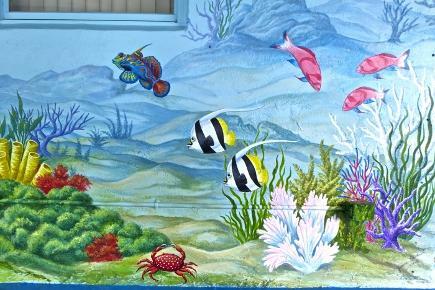 Below: Detail of the Tuscan mural above. 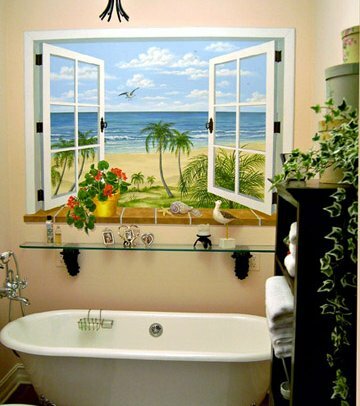 Above: BEFORE and AFTER A small bathroom feels less confined after having a window view painted above the tub. 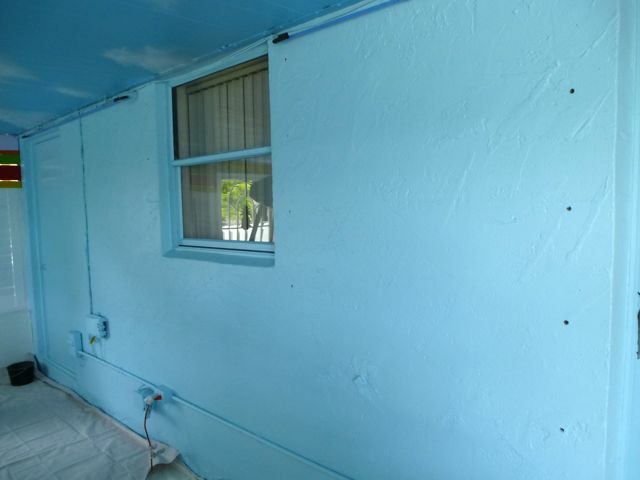 Above Left and Right: "Before" and "After" photos, showing how a small cramped bathroom is "opened up" visually by painting a window with an ocean view. 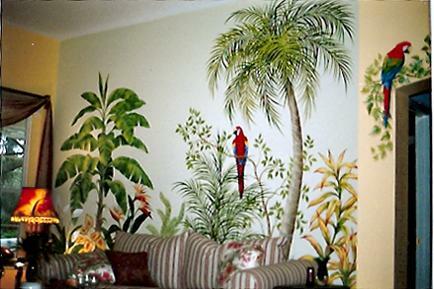 Above: Tropical foliage and parrots grace the wall of this living room. 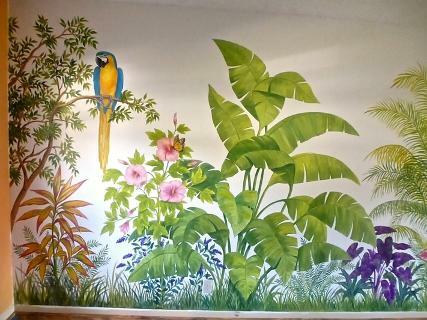 Above: Still in progress, huge project, this mural is 12 feet tall. 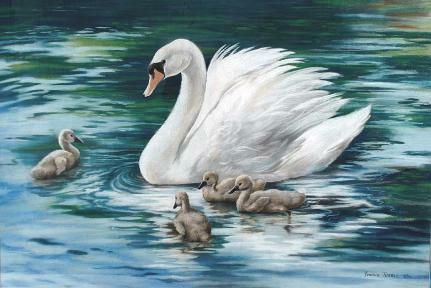 Working on the background, with the best yet to come! 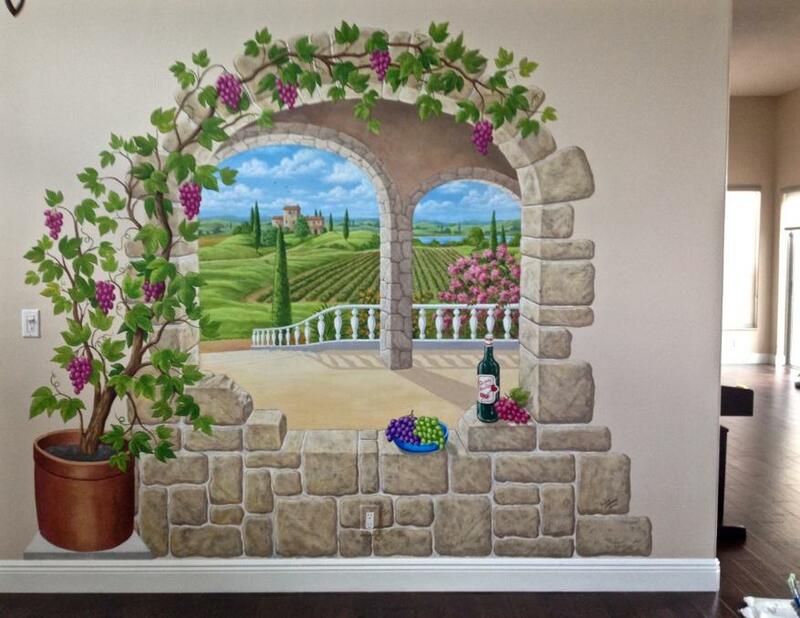 Above: What was once a plain wall with a simple alcove, has been painted to give the appearance of a stone wall with a view of a garden pathway. 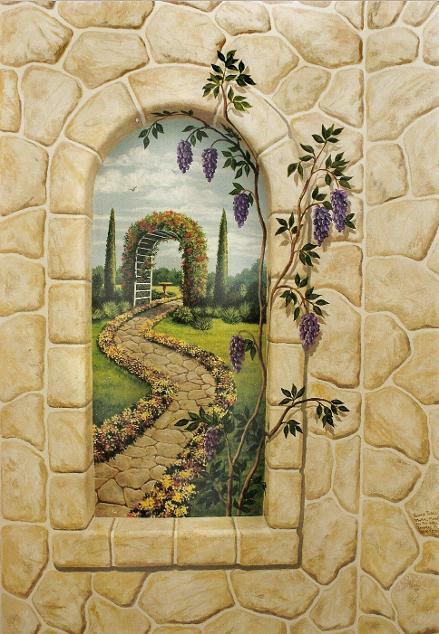 Below: Another trompe l'oeil window in a hallway alcove is painted to show a beautiful Tuscan landscape. 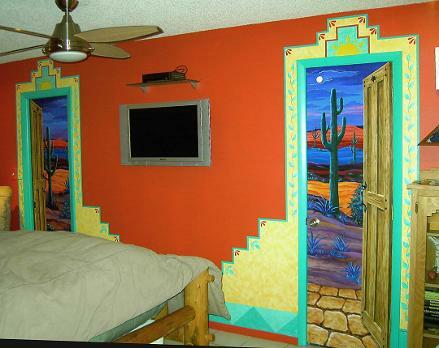 Below: Two closet doors painted to give the illusion that they open to the desert. Client requested these brilliant surrealistic Southwestern colors. 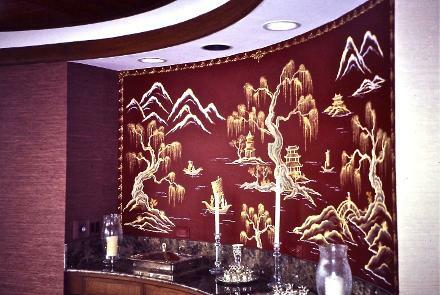 Above: Dining room - Chinese style landscape graces the wall behind this server. If you have photos or clippings of a particular subject or scene, they can be used as a guideline toward the final design. 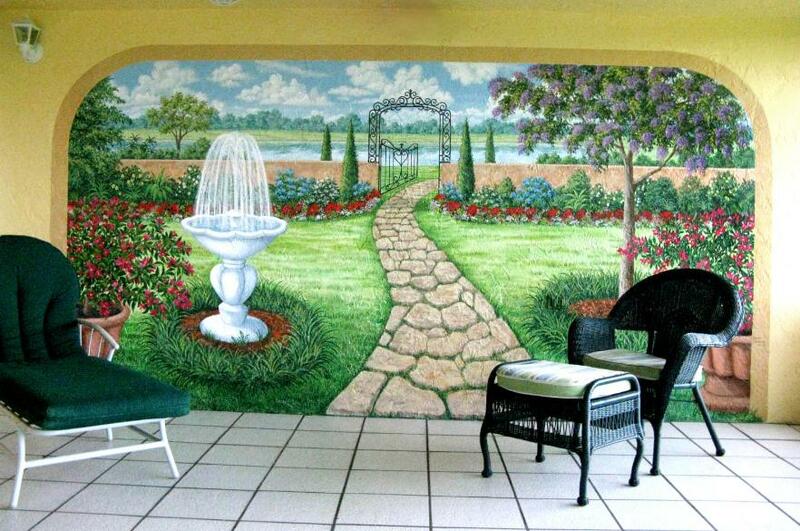 The sky is the limit as to what can be done to enhance your decor. As you can see, the quality of my work speaks for itself. 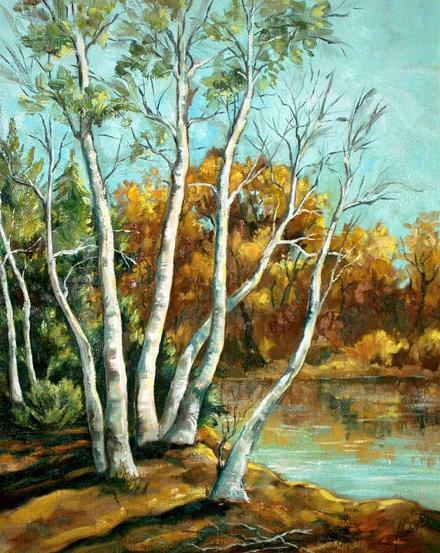 It is important to me that you are pleased with the finished project, for it is something that you will want to enjoy for years to come. 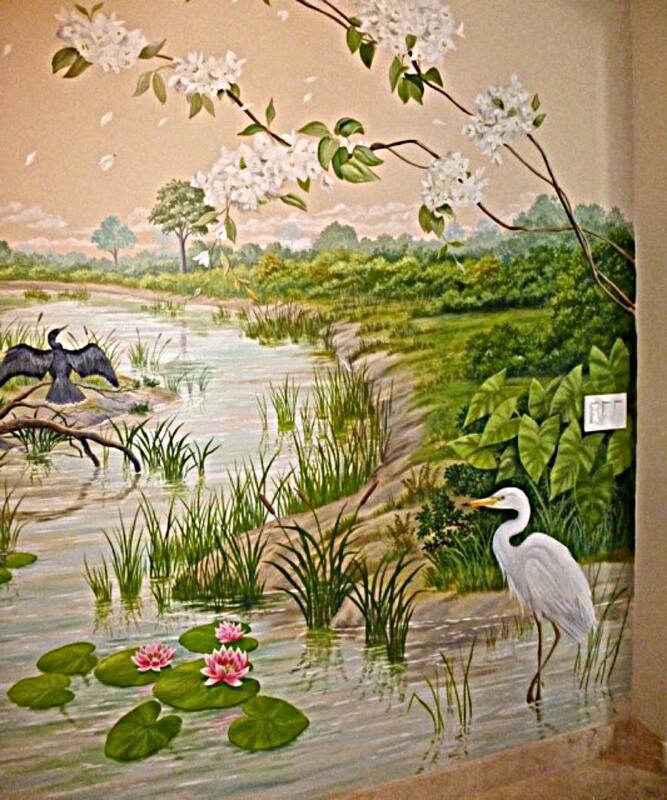 A mural is not something that you want to hire a novice to paint. 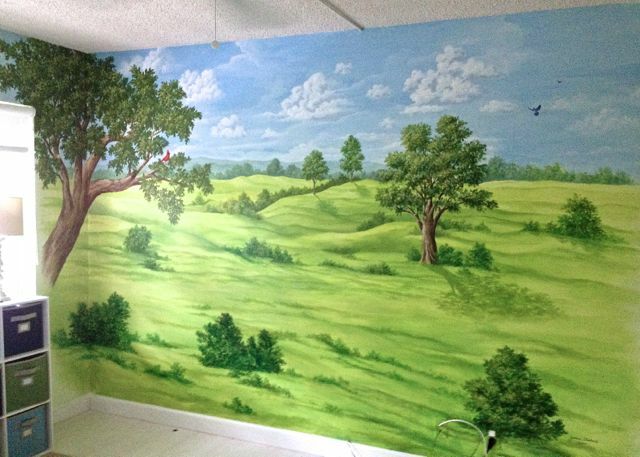 If you call on me to paint for you, I can assure you that you will have a fine custom mural. 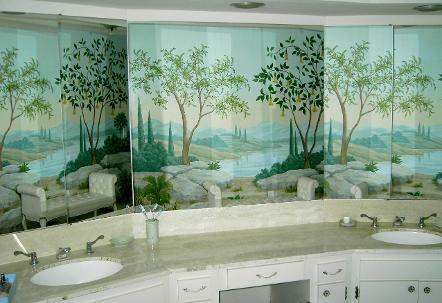 Above: Bathroom mural shown at the right as reflected in three mirrors above a duel sink, opposite the mural wall. Above: Doorways to the Arizona desert. 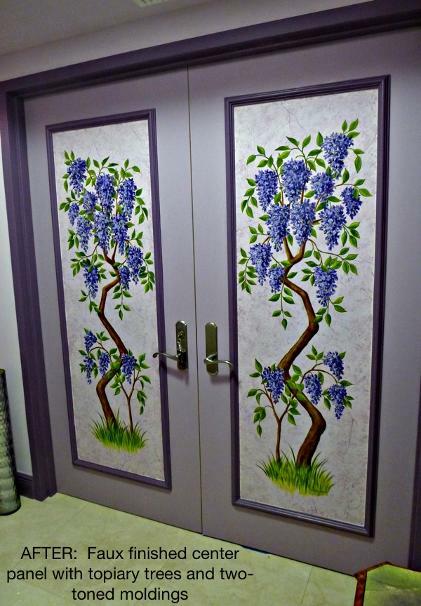 Two closet doors are painted to give the illusion that they are open to these evening landscapes. Southwestern theme. 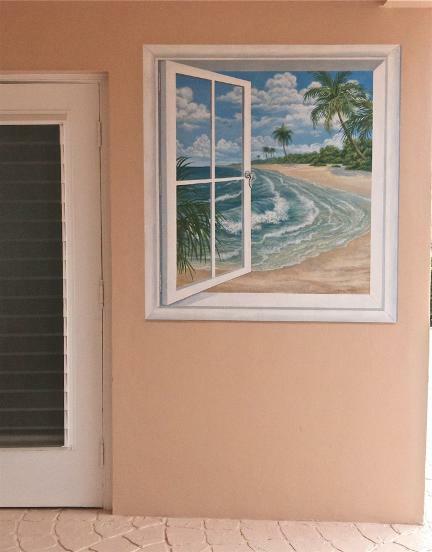 Below: The open window, including the windowsill with potted plant and seashells are also an illusion which has been painted on a flat wall. 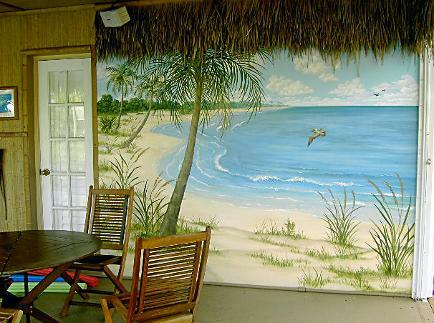 Above (before) & Below: This is an exterior wall, which really was not the ideal wall for a mural. It has electrical conduits and boxes on the surface, a window in the middle, and a door at the far end. 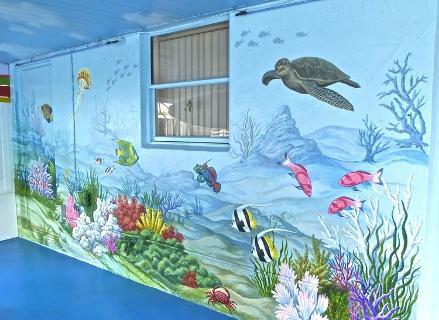 Considering all of these obstacles, I believe I managed to give it a whole new look with this "under the sea" mural. 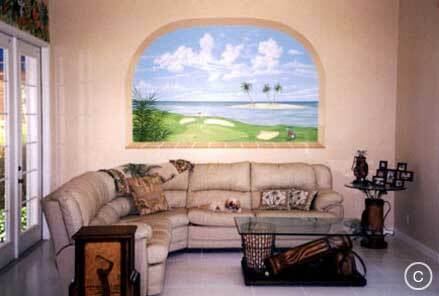 Above: A golf pro's living room with a trompe l'oeil window of his favorite golf course. new home. 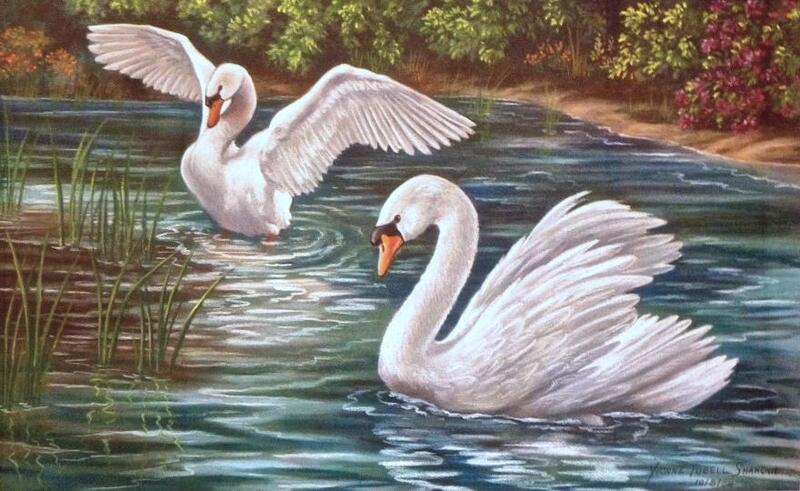 The swans are a perfect finishing touch! 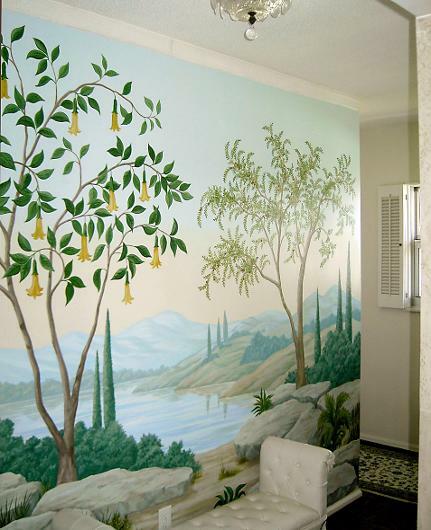 Above: This mural was painted on canvas and then applied to the wall in this bathroom. 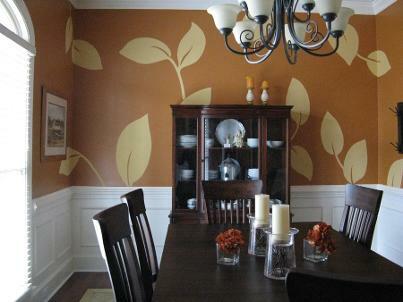 Below: A window painted on the wall of a dinette gives the room an open and airy feeling. 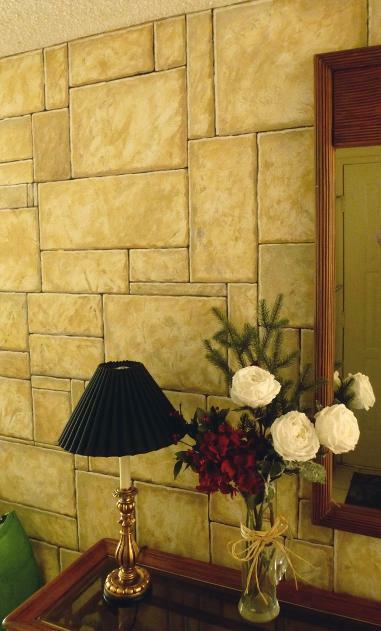 Above: This faux fireplace is a perfect example of "Trompe L'Oeil" ( a French term, meaning "To fool the eye". 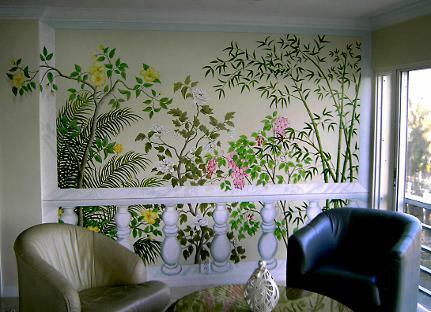 I painted it on the wall in my client's living room. 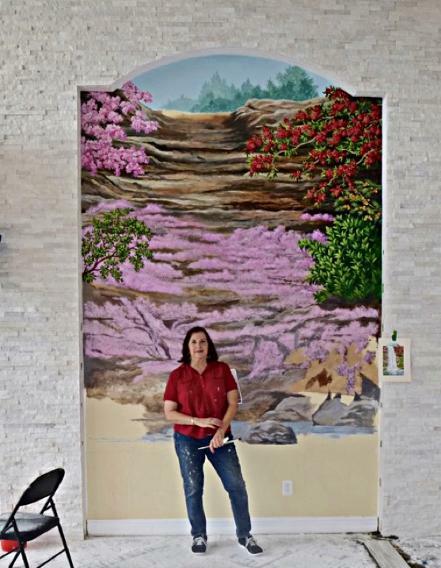 It is important to not only paint the fireplace itself, but by also painting cast shadows on the wall next to it, the feeling of depth and dimension are created. 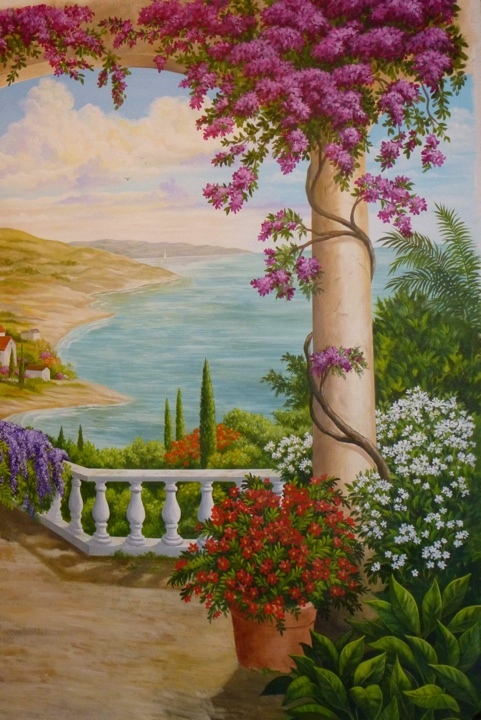 The mantle is an actual shelf which was attached to the wall, supported by two corbels, but the candle stick and the vase of flowers was also painted. 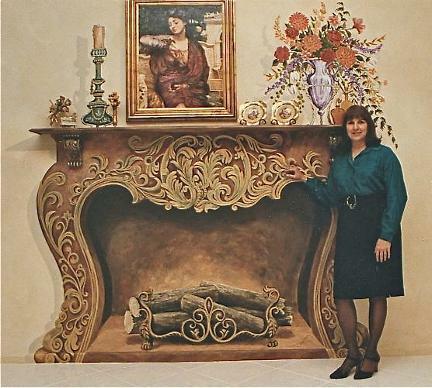 The framed painting and the other small items on the "mantle" are real. 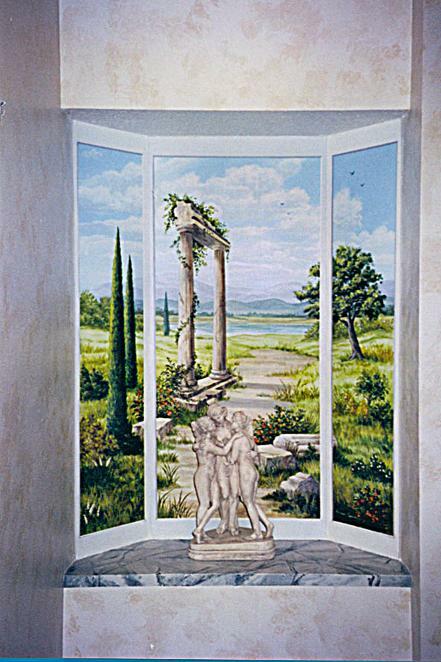 Below:: Trompe l'oeil of a window painted on an exterior wall. 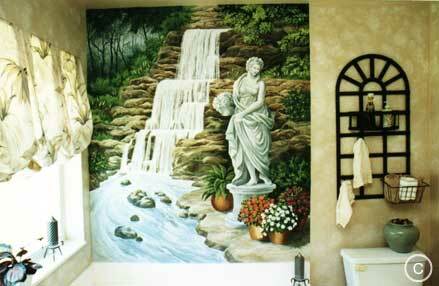 Above: Landscape on a wall in an elegant bathroom dressing area. 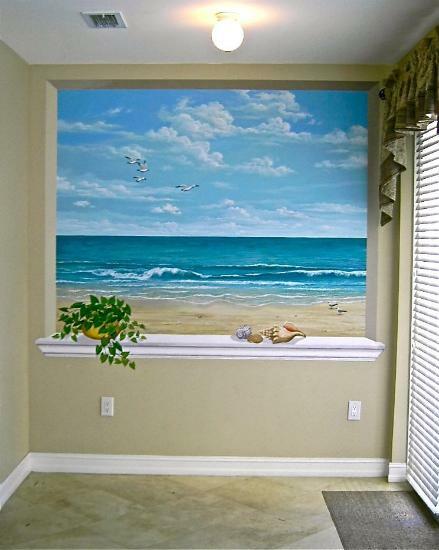 Wish you had a view of the ocean outside your home? The effect can be created for you. 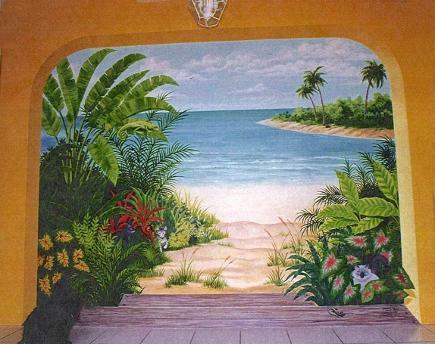 Above: A curved wall gives way to a painted archway leading to a tropical beach scene. 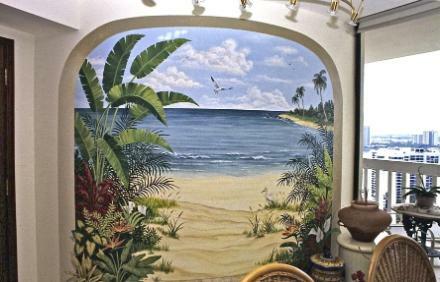 Left:The open window, including the windowsill with potted plant and seashells are also an illusion which has been painted on a flat wall. 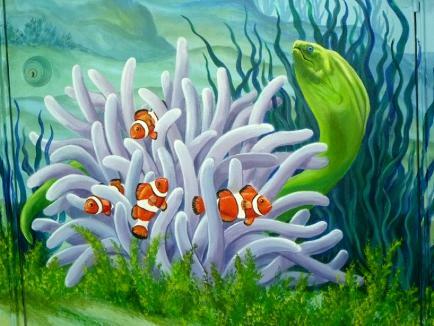 Let me paint what you imagine!